We believe that building your new landscape should be an easy and rewarding collaboration from start to finish. So we've developed a simple, modern build process which sets us apart from outdated, expensive traditional construction. We combine your wishes and needs with our design and budget sensibility to create something that's distinctively yours, yet more than you ever imagined. 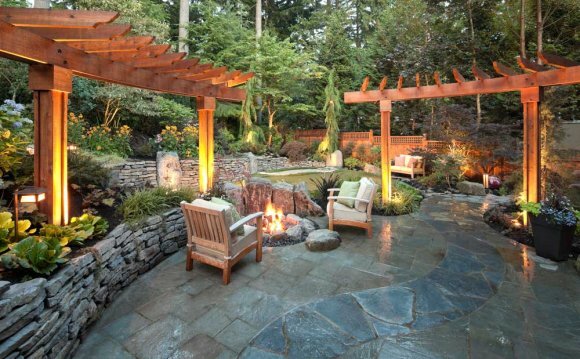 The design process begins with a personal assessment of your property and landscaping goals. We then begin with a concept, making plot plans, taking elevations, allowing us to develop a master plan that helps you create your landscape efficiently – on your timeline, and within your budget. Every local administration can be different when it comes to regulations. The team will verify the feasibility of your project so it's designed and built to meet local requirements. Although you may communicate with a single designer on your project, you have an entire team of Dennis' 7 Dees employees working behind the scenes to ensure we don't miss a beat. Our team works with advanced design technology to present you with an accurate, life-like design of your space so you know just what to expect. Our construction crews are led by the best in the industry. We have a spot on safety record and punctual project management to ensure your new landscape will be installed on time and on budget. By doing a final walkthrough with you, we ensure both your satisfaction with your new landscape, as well as the ability for us to put our last stamp of approval with pride on a job well done. We combine your wishes and needs with our design and budget sensibility to create something that's distinctively yours, yet more than you ever imagined.